The prince is eager to get to the princess in this horse farm game because she is waiting for him for quite a while. The issue is that there are plenty of obstacles in his path and you will have to make an effort to get there. Jump over all the fences and fallen logs and this way you will not trip and fall. Collect the apples and carrots for energy and soon enough you will make plenty of progress. There are also quite a few bonuses waiting for you and if you collect those you can gain more speed or invulnerability. Finish all the lovely levels and you will meet the princess. Try not to fall too many times in this horse running game. Elsa and Rapunzel invited you for a girls day out! Join the princesses right away and let's make sure they look perfect. The two of them have chosen a nice place and they can't wait to take some selfies, but before they could do that they need some pretty outfits. Become a fashion adviser in this brand new dress-up game. Find the most beautiful accessories and clothes. Don't forget about shoes! You can also pick new hairstyles and you can even choose a new phone case for Elsa. 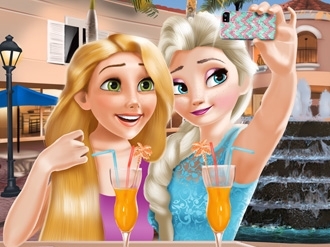 Make Elsa and Rapunzel look better than ever and enjoy your time with the two princesses! The beautiful Tangles princess, Rapunzel, loves pets. Her favorite pet is the very cute cat named Summer, who is very playful and sweet. 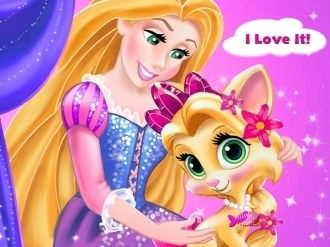 Rapunzel loves to take care of the golden kitten and you can help her. She will need a pampering session and brand new accessories. Start the game called Rapunzel's Palace Pet: Summer and use the tweezers to remove the bugs from her fur. Summer is almost over. Rapunzel wants to fully enjoy the remaining good summer days, so she decided to throw a summer pool party for girls. Let's start making preparations for her! First she needs a glamorous makeup look. Choose bold and bright colors to create a summer party makeup look that really pops out in the crowd. Then for the outfits, there are plenty of choices. Cute bikini with fringes, one piece swimsuit with cross strapes and floral rompers, which suits Rapunzel the best? A pair of sunglasses and a cute wide brim sun hat are also necessary. 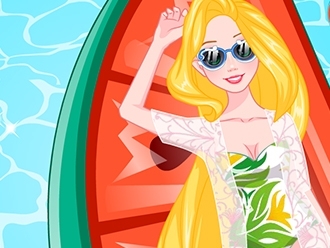 Use your fashion talent and help Rapunzel select the best pool party items. Don't forget to bring your pool party essential - pool floats. Pizza slice, donut and pineapple floats...This is gonna be a delicious pool party! Have fun playing Rapunzel Summer Pool party! Rapunzel wants to get inked for the first time. She comes to your tattoo shop for help. First, let's help Rapunzel decides where does she want to get a tattoo: shoulder, arm or leg. She has the chance to get a second and a third tattoo as well! Then choose a tattoo design for her. Rose, angel, stars or heart. Which is better? Сhoose a tattoo design that suits her the best. 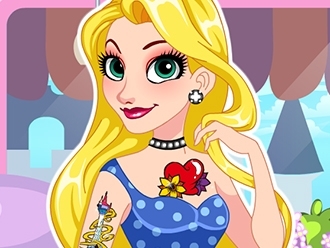 Have fun playing this Rapunzel Tattoo Design game! 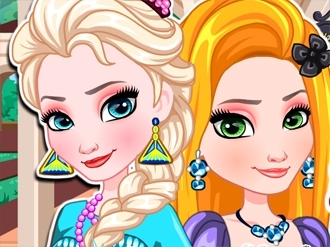 Frozen Elsa and lovely Rapunzel are pretty good friends and they decided to have a girls night out. In this Elsa And Rapunzel Matching Outfits you need to be their make up artist and fashion adviser. The lovely princesses would like to have matching outfits but at the same time they want a different and one of a kind look. Do you think you will be able to help them out? 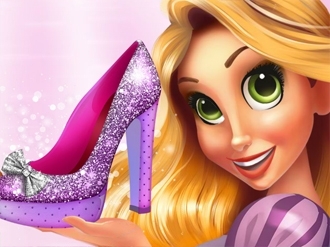 Hello Ladies, Rapunzel needs a bit of help and maybe your fashion skills might come handy to her in this Design Rapunzel's Princess Shoes game. She is hosting a ball at the palace and every king, queen, prince and princess is going to be there. This is going to be the biggest event of the year and Rapunzel needs to look absolutely gorgeous and astonishing. She must make a good impression but she is having a problem. She has found the most beautiful princess dress to wear but she couldn’t find a pair a matching shoes. She must now find someone who could create her a pair of custom made shoes. Have fun!